However you classify it, Golf is the single best hobby, sport or game ever played. BiGbOysgoLF is an ongoing justification of that statement. Enjoy and thanks for stopping by. I have been away for quite sometime due to some personal health issues. Golf has been one of the things that has helped me during this time. My life has changed a great deal in the past 8 to ten months and while I adjust, one thing has been constant and that is my love for the game of golf. Golf continues to teach me although it takes a while. I now have some physical limitations that make hitting the ball that much harder and frustrating. Even though its frustrating, I still get to laugh at myself for the shots I sometimes try to hit and feel the gloom of watching the golf ball go exactly where I did not want it to go. I do not know if I will be writing much in this blog in the future but I will keep it open and available for times when the urge to write strikes me. My prediction for the US Open is someone other than Phil or Tiger. Too much hype on their match up. Its been a while since I last posted. A lot has been going on. My golf game is improving and the more I improve, the more I enjoy it. In the past month I have purchased a new iron set (dimension z) changed to an 8.5 X-stiff Taylor Made driver and won my first tournament since starting back up in playing tournaments. Probably the most important thing in my improvement is not the new clubs. It actually is the amount of work I have put in on the range and learning that golf is a game of tempo and slow is the only tempo that works. For a type A personality, this has been a difficult lesson and while my tempo has improved, the desire to hit a 300 yard drive remains. I read a great deal about golf and the swing. There are a few blogs out on the web that have a great deal of information regarding the swing and close game. 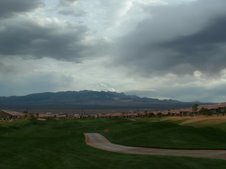 The Wedge Guy is a great blog and the Wedges being sold by Terry Kohler may be the best wedges you can buy. Terry's thesis is a very simple one and its keep it in the fairway at all cost and work on the close game more that you do the long game. I have taken his advice and worked a great deal on the close game and the driver. The driver is according to Terry, the number 1 scoring club in the bag and I agree completely. If you do not hit the driver straight and with some length, there really is no shot at making par on a consistent basis. This has been a key for my improvement as I am now much more in tune with hitting the ball straight 270 yards vs. into the hay at 300 yards. My next tournament is August 4th with the club championship coming about three weeks after that. I am considering entering the championship flight even though my handicap is a 10. I continue to improve and I seem to play better when I play with better players. That is all for now. Hit em straight. I played 18 yesterday and it may have been the worst round I played in over 2 years. After a par, par start, the wheels came off and I blew it. It has been years since I threw a club but on hole number 5, I could no longer remain mature and composed. What in the world causes this type of reaction to a bad round or a few poorly hit shots at the worst possible time? After thinking about this quite a bit the past few hours, I am certain of two things. First, expectations tied to a particular score or range of scores can be lethal. Secondly, if you have unfinished business with work, family or friends, (interpersonal issues) and you take it to the course, you're done. I think the first issue of expectations related to scores is a big one for me. I have been practicing and playing a great deal for the past 2 months. Additionally, I just returned from what I would call a golf boot camp at a course in Idaho where one of my friends is the head pro. While on the range, I am hitting woods and irons better than ever. 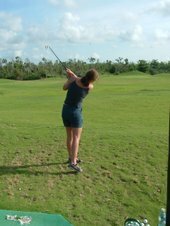 I have worked on posture, left wrist breaking down and slowing my tempo. Going back to an earlier post, on the range I can do little wrong. Yesterday my expectation was to break 80 on a nice and very playable golf course. I am not sure why of all days I decided that yesterday was it but none the less, I was ready to go low. 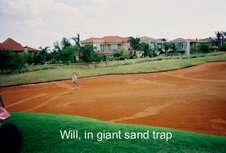 Having that expectation I am sure was a total set up for failure and here is why; the moment I tripled the 3rd hole with a lost ball and a three putt, I was done. Done meaning the amount of pressure I placed on myself after the triple led to a series of two more bad holes trying to make birdie. By the end of the 5th, the wedge went about 100 ft into the air. I am not proud of my behavior nor am I pleased with the collapse. One thing I have managed to learn during my life is to make things right through apology if needed or forgiveness of myself. So while I am greatly distressed by my play yesterday, I am working my way through the forgiveness process. More importantly, I am beginning to really understand the meaning of one shot at a time. Golf the teacher has found a glaring weakness within my game and me. Now golf will teach me even greater patience and composure to be sure. One shot at a time. The second topic is fundamental to an enjoyable round of golf. Leave any issues from the rest of your life at the course parking lot or better yet solve them prior to arriving at the course. If I am thinking about a project at home or work that is not going well or if there is friction in any of my relationships, the round of golf is just not as enjoyable. The more I play golf, the more I am convinced that the mental side of the game is every bit as important as the physical side of the game. In fact, I am really beginning to ponder how important all the technical swing related work is if my mental game is weak. Only in golf do you have equipment, technical (swing), mother nature, course designers to deal with and then you have your own emotions to concur. How could this not be the best and most compelling activity ever created? 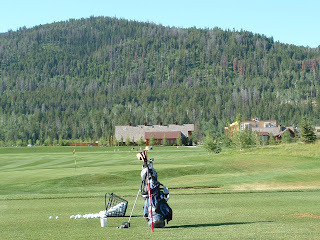 Cyndy and I snuck away for a few days to La Veta Colorado to play a little known Wieskopf course named Grandote Peaks. I am very glad we went. We stayed in La Veta at the La Veta Inn. First class establishment in all facets. The room was clean and quaint, the bar stocked, food fantastic and the outside patio in the evening is a dream. Give them a look some time at Lavetainn.com. Scott and his staff will take very good care of you. The golf course itself is nestled in a valley surrounded by mountains and in particular the Spanish Peaks. The design is perfect if you enjoy hitting your driver and longer irons. Only a bit above 7,000 yards from the tips, the course is no push over. The superintendent does a great job with the course. The greens were a bit slow but they were just verti-cutting and double cutting the greens today. My guess is they will be at 10 or 11 in two weeks. My game continues to improve and I am pleased with my progress. I am actually considering changing drivers over the next week. Not that the R7 is not great because it is a superb driver. The Taylor 200 steel just seems to fit me better and provides the trajectory I am looking for. The experiment has been going on for a week or so and I am tempted to switch. Cyndy's game continues to improve. Its such a good time watching her progress. In time, she will be tough to beat. Our little get away was just what the doctor ordered and I can't wait to sneak away again. Playing golf, eating good food, drinking good beer and being with Cyndy. What more could a guy want? Since my last post I have played several nice courses. The best so far has to be Eisenhower's Blue course. Unrelenting and the greens are terrifically fast and have a great deal of break. 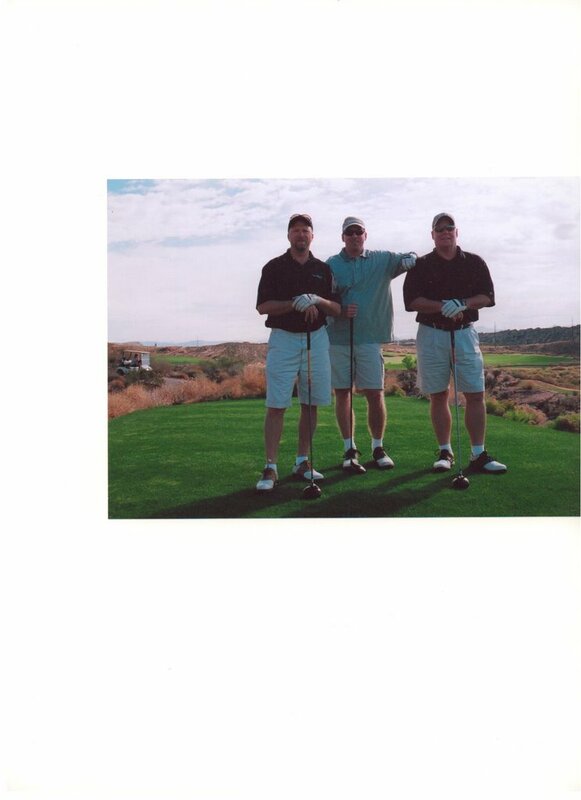 I am biased since I was stationed at the Academy 23 years ago and played both courses often. The Blue is still a classic course in the truest sense of the word. I doubt I will play too many courses better. My swing continues to evolve and I might add with some really positive results. I love to shoot a great score but right now, I am much more into learning how to shoot great scores more often than not. For me this allows a bit of freedom to try the seven iron bump and run or a driver on a tight par 4. I think its about limits and being able to know what is a shot that can be made on a consistent basis and one that is only for hero time when you absolutely need it. My goal for this golf season will be to shoot in the 70's on a regular basis. I think by August this will happen. For now, I am playing a lot of golf and loving it. Think about the right knee the next time you're on the range. Peace. Yesterday was Memorial Day and for most of us a day off from work. For many, this is exactly what the day is, a day away from work. Please do not get me wrong, as I am for any day that enables me not to be at work... For others, myself included, its a day to remember, revere and most of all be thankful. All too often members, past and present, of our various military services are taken for granted. The sacrifice we see day after day on television gives us pause for a brief moment and on we go with the day. The past sacrifice made by millions throughout our country's history is noted in books and through various shows on television. We watch at times in utter disbelief what our men and women have accomplished and sacrificed in warfare. My father was a three war veteran and my guess is he is one of the few who could claim this. He served in WW II, was taken prisoner, walked the Bataan Death March and worked in the Manchurian mines in what could best be described as conditions unmatched in their gruesomeness. He also served in Korea and Vietnam; thankfully without incident. My grandfather and step grandfather served in WW I. I myself am a proud Air Force veteran that somehow managed to stay in long enough to get an education (associates degree) that led to bachelor's degree. I have several other relatives and close friends who have bravely and honorably served their country. Personally, my record in the military was a mixed bag. Two article 15's, promotion to Staff Sergeant on my first try and I did actually earn a few medals. Given my penchant for beer, the party life and lack of maturity, its a miracle the Air Force kept me. Believe me, what I received from the Air Force was much greater than what I gave. Self Discipline - I will do whatever it takes to complete my assigned tasks. Pride - Doing things correctly and looking sharp while doing it. Military Bearing - Stand up in a professional manner when the chips are down. Maturity - Being put in charge of others at 21 or younger speeds up the process. Friendships - Life long and unbreakable. Experience - Travel, job training and hands on work. 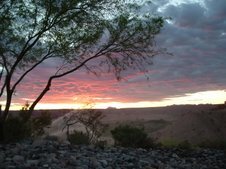 Awakening - Did not know how far I could go until I got in the service. Citizenship - I still stand at attention during the Star Spangled Banner and love my country. My question to anyone who does not like the military or downplays the virtues of the military life, name one entity that can take a raw young person headed for jail or worse and do this in 7.5 years? Thanks grandpa and dad! Your guidance and love helped me to make the best decision of my life. Memorial Day is much more than a day off work for me. It is a perfect Memorial Day here in Colorado. The sun is up, the skies are clear and we have a tee time today. Sunday mornings are important to me. I enjoy a good cup of coffee and the quiet of the neighborhood while Luke gets his early morning walk. I tend to believe most of us have some sort of ritual in the mornings and Sunday is probably the most adhered to. For me its a time for quiet and most Sunday's, a bit of reflection. The golf swing can also be thought of as a ritual. 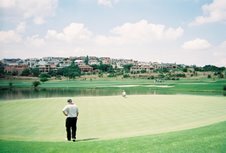 Its something golfer's do on a regular basis with varying degrees of attention, reflection and most importantly quietness. There have been forests worth of paper used to detail the "proper" mechanics of the golf swing (I suspect there will be several more too). 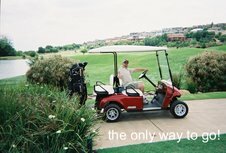 Golf academies, vacations built around lessons, the golf channel and on it goes. I doubt there is one sport that has so many methods and or media channels to "help" the average golfer improve. The industry itself must be in the billions of dollars and yet I doubt most golfers can break 100. This to me is fascinating. When you couple the help that is out there in the form of teaching and the improvement in golf club technology, how can we not improve? Personally, I think the advances in golf club technology are great. There is nothing better than upgrading your tools. I recently purchased a few new clubs on ebay and unabashedly admit to being exactly like I was at 7 years old waiting on Santa to deliver the new bike. I would check the tracking numbers daily (sometimes hourly) to follow their course to my new bag. Its been Christmas here for about two weeks and it has been a blast. Christmas not withstanding, these new clubs will not improve my game one bit without something else and that would be a fundamentally sound and repeatable golf swing. This is ultimately where the rubber meets the road in golf. If your swing does not square the face of the club at impact, there is no club known to man that will help you break 80 or 90 for that matter. The advances in swing training are equally astounding to the revolutionary improvement in tool technology. Video, software programs for both the full swing and putting, year around high tech training programs all are but a part of this explosion in swing technology. Thousands of golfers are involved in one way or another with this new technology. Thousands more read books, blogs and magazines, all in search of that one magic teacher, swing thought or tip. I am also very much in favor of the advances in training methodology. This June Cyndy and I are taking a little 5 day holiday to visit one of my dearest friends. Matt also happens to be the head professional of a very nice golf club. Over the past 30 years, Matt has become an excellent golfer and teacher. His club is top notch and so is the training they provide. 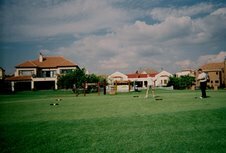 Computer and video analysis, top of the line club fitting and tremendous facilities. A golfer's dream really. One of my best friends is going to work with me using all of the available technology on a dream golf course in a dream location. I am blessed. The interesting part of this trip for me is not so much the training Matt's team will provide. Nor is it the professional fitting and the new irons I will purchase. What has captured my attention is the amount of self awareness I will require to make positive use of what is being offered. One definition of ritual is any customary observance or practice. The ritual of prayer comes to mind as well as the marriage ceremony or the Memorial Day holiday. When one observes Monday as a day off from work and I am sure we all gladly do, they are practicing a long standing ritual. The golf swing can also be viewed as a ritual. On the tee box, I scan the hole to determine my target. I then approach the ball and set up to swing all the while focusing on my target line. A few waggles and some dancing feet precede the initiation of my swing. My swing follows a nice path back and from the top, I fire towards the ball. I then normally cuss a lot as I watch my ball flight. This is a ritual if there ever was one. I try to do the same thing or practice this same ritual each and every time its my turn to play minus the expletives. Just because I claim to have this ritual does not mean its of any value to me or my golf game. Ritual by rote is if anything, worse than not having a ritual at all. By giving the appearance of strict adherence to this ritual, I am signifying to my playing partners that I am serious about my game and my score. I also think that if I happen to be having a good day on the course, it further serves to show my passion and commitment to practicing this ritual well. All for show perhaps? As with anything else, practicing a ritual well is the key to its success. By merely following a pre-set ritual without awareness, reflection or self discipline I simply am going through the motions and my net gain is zero. This I think is the crux of the problem for all golfers. While I buy the best equipment, seek out the best swing tip or training program and practice a pre-swing routine, it ultimately matters very little if I am not self aware. I am sure you see it at the range time and time again. The average golfer is intently hitting golf balls over and over again. The ball leaves the club head only to start the all too familiar arc of the slice. A slam of the club, a muttered expletive or a complete look of disgust follows. The interesting thing is this same shot is hit for the entire bucket of balls and the very same behavior happens post shot. If you have not noticed this in yourself, next time you are at the range, stop and observe any average golfer. I have come to the conclusion that to truly improve my swing and ultimately my golf scores, I have to pay attention to the details of my swing. To really pay attention, I must be fully present at that moment when I am setting up to make a pass and keep it throughout the swing to follow through and beyond. This awareness enables me to feel which part of the clubface the ball was hit with. By watching the flight of the ball I can determine my swing path, correct or not and by looking at my divot I can further confirm the error or success of my swing. Self awareness comes ultimately from self discipline. True self discipline comes from self love. Yes, I said it. If one loves themselves warts and all, discipline follows and then begets awareness. Golf is all about being aware throughout the swing ritual not just for that one shot in particular but for every single shot hit afterwards. So what does a repeatable and fundamentally sound swing require? Love.